In the Jam and Fruit Spread category Eden Apple Cherry Butter was the winning Readers' Fave. "Spreadable fruit that tastes like it's straight from the tree," they say. Eden Apple Cherry Butter is U.S.A. family orchard organic apples and organic Montmorency tart cherries kettle cooked with a bit of Eden organic apple juice concentrate. Over four pounds of fruit is in each 17 oz. jar. It's a tangy sweet spread with brilliant flavor. No refined sugar or anything else ever added and kosher. 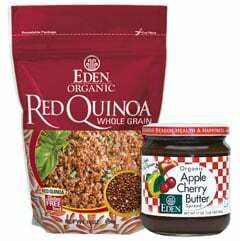 Eden Organic Red Quinoa took Readers' Fave first place in the Rice and Quinoa category, "Go red for a delicious, nutritious side dish with good looks and a nutty flavor." Eden Red Quinoa is rare pasankalla variety, family plot organically grown on Bolivia's Andean Plateau at over 12,000 feet. Quinoa has the most complete amino acid profile of all grain and is fiber rich. It is quick cooking with delightful fluffy texture. An ideal entrée, and in soups, stews, salads, and desserts. Gluten free. kosher. Original Edensoy Extra organic soymilk was first runner-up in the No Moo Milk category. "Organic goodness for your glass," said readers. Edensoy is the only U.S.A. made soymilk properly prepared to nurture human beings, and the first soymilk in North America to be verified compliant with the Non-GMO Project Standards for avoiding GMOs. It's made of 100 percent U.S.A. family farm organic soybeans and grain, fortified with the finest bio-available vegan vitamins and calcium that can be procured. Only gentle unrefined sweeteners are used. kosher. Eden Ume Plum Vinegar was first runner-up in the Vinegar category. "Perfect for rounding out flavor in sauces and stir-fries." It's also ideal for salad dressings, dips, and pickling. Eden Ume Plum Vinegar is a festive, flavorful vinegar and condiment that is traditionally crafted in Japan. Its ruby red color is from shiso, aka beefsteak leaf. Skillfully and laboriously made with absolutely no chemical additives. kosher. Eden Foods is a 42 year principled manufacturer of natural food offering more than 250 authentic, organic, traditional, , Pure foods. All are superb pantry fare. Information and over 980 free recipes are at www.edenfoods.com. Retailers, institutions, and co-ops, please visit us at access.edenfoods.com.